Control zones for additional point bonuses for your team. Capture and hold zones, and then rack up kills against the enemy team while your point bonuses are active. If you’d like to learn more about Salvage, click here. 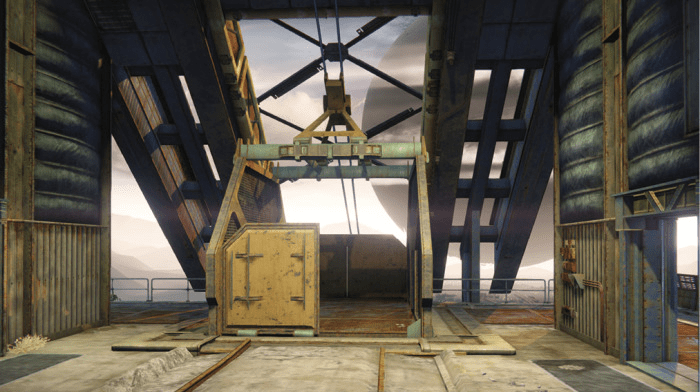 For more general PvP tips about all of the modes, click here. Most of these maps have been updated with the latest patch, which you can read in here. In this game mode, try to focus on crowd control and zoning. Capturing zones awards points and super energy, and you’ll get more points per kill when you hold more zones. The easier you can shut down lanes or apply pressure away from your zones, the better time your team will have holding it. 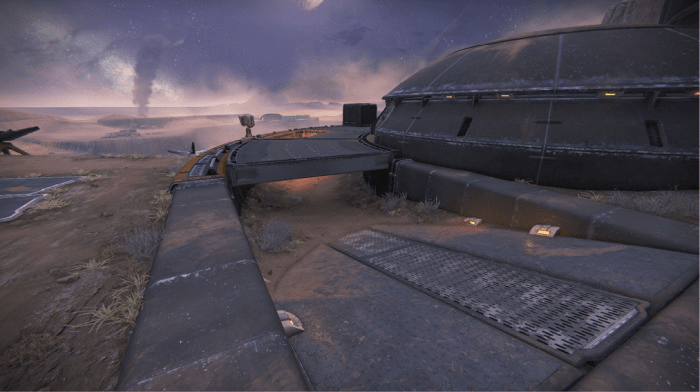 Objective players should opt to use supers like Fist of Havoc, Nova Bomb, Ward of Dawn, and Arc Blade, as they shine in Control due to team clumping. Use your super to clear out a capture zone. 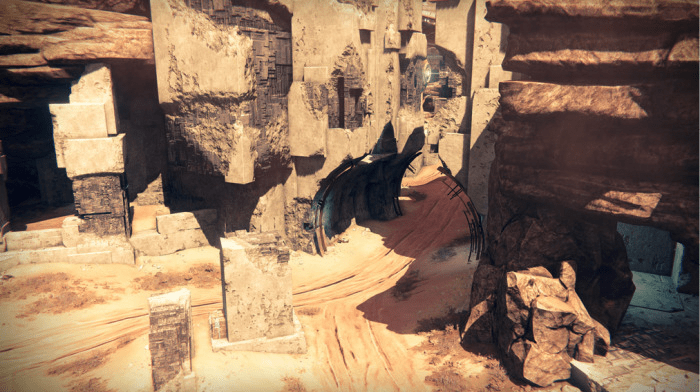 More aggressive kill-focused players should opt for Golden Gun and Radiance, as those supers excel at killing a large number of enemies over a longer period of time. A good team composition will have a balanced mix of players on offense and defense. Click here to read more class-specific guides. Grenades that leave a field or spawn seekers are key in this mode. These grenades can keep your enemies off capture zones long enough for you to stage an attack. 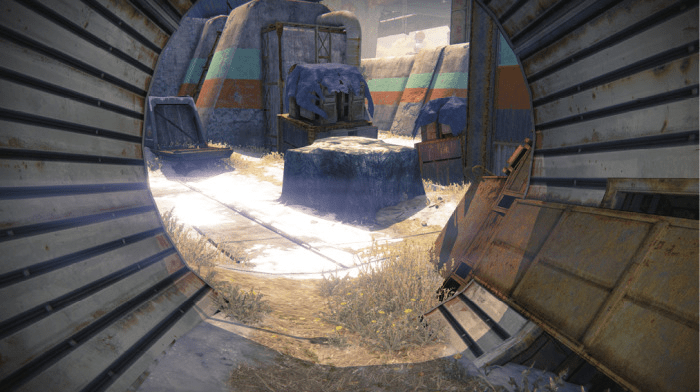 For more about Destiny’s grenades, click here. Capture and defend two zones, and don’t bother with the third zone! By doing this, you force your opponents to spawn around one location, which allows you to plan your attack around their spawn. Heavy ammo spawns at 9, 6 and 3 minutes to go on every map except First Light and Bastion, where it’s considerably faster (10, 8, 6, 4 and 2 minutes to go). Always try to get the heavy ammo, unless you notice that the other team is trying to use it to lure you out! 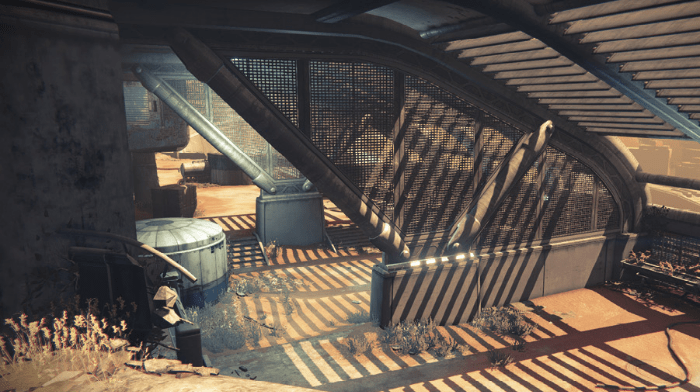 You’ll want to memorize where the heavy ammo spawns. Be sure to coordinate with your team when the announcer informs you that the heavy ammo is “inbound” so that you all can get some easy kills with it. Bravo team starts at a huge advantage, spawning right next to point A. Alpha, once you’ve captured point C you’re going to want to capture point A as soon as possible – spawning near point A gives you a quick run to assault/defend point B; defending two points is the key to victory. The big doors take a moment or two to open up. If you think one of your opponents might be on the other side, take a few steps back and get ready to fire as soon as the door opens. If you’re playing against a good team or individuals, “C Window” can be a death trap. Zones B and C are both easy to defend from each other. If your team spawns near A, try to capture C as soon as possible and use it as a base to assault B. The roof above where point C used to be is a great place to defend the new C location. Despite the changes to Blind Watch for Control, C+B are still the definitive locations that you’ll want to control throughout the match. If you’re at A, you don’t want to focus much of your attention on recapturing B, rather you should be trying to constantly flip the spawns and recapture C.
There are a couple of great places to snipe on this map: towards the rear of the map near point C, and on the platform of point B in particular give you great vantage points. Jump around the right hand side of point B onto a rock pillar in the middle of the abyss: This is handy if the rest of your team is trying to take B from the front or from the left hand side as there’ll often be people hiding on the edges regenerating health or waiting for someone to run in to shotgun them. Likewise, if you’re defending B, hiding as above (around the corner from the door) can often coax people into running in where you’ll be waiting with your close range weapon of choice. Control B+C as much as possible; this combination is particularly useful if you have 1 or 2 great snipers on your team. 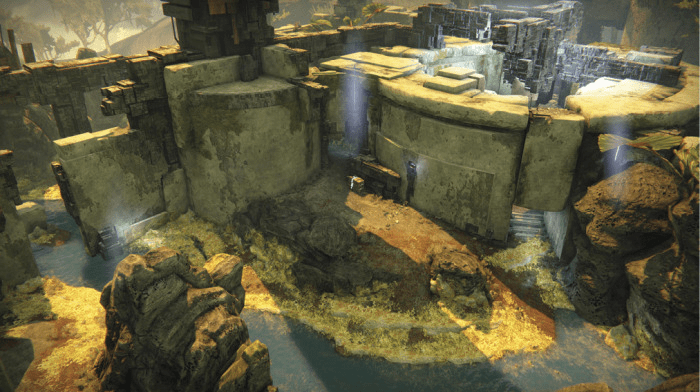 Good snipers at C are able to cover enemy guardians attempting to capture B with headshots at the rock near the C spawn. When In Control of A and attempting to capture B: try setting up shots as a sniper and picking enemies off at B before pushing for a capture. When in Control of C and attempting to capture B: Sniping from the C spawn rock can open up opportunities for your teammates to capture the point. Alternate attacks between the “B door” and sparingly use the Heavy Ammo flank. While just about every map is fantastic for shotgun and fusion rifle users, this one is definitely one of the best for it. Lots of tight areas favour these close range weapons, so put your Ice Breaker away and get rowdy! While all three points are pretty easy to defend, B is probably the hardest because of the super close quarters. That said, the spawn point at A funnels most players straight into the control point, which makes it easy to pick them off one by one by standing on top of the stairs right next to point A. If you have to pick and choose two points to try to control, make it B+C. If need be, you can jump around the side of the map where the giant cannons periodically fire off into the nothingness. This is great for sneaking up behind point A where people might be defending. When in Control of C and attempting to Capture B: Mix up rushing the point between the “tree wing,” “bottom hall” and “mid boxes.” When using a sniper, move towards the “Open Wing” and look to snipe players pushing towards the point from A walkway. Alpha spawns in the middle of nowhere and will take longer to capture their first point – most random groups of people will split in half at the start, with half going to A and half going to C and being decimated by Bravo. Don’t be those people! Point A is perhaps the easiest to defend, and B is a short walk from there. Try to make holding A and B your priority, and focus more of your defense on B (being the closest point from C’s spawn). 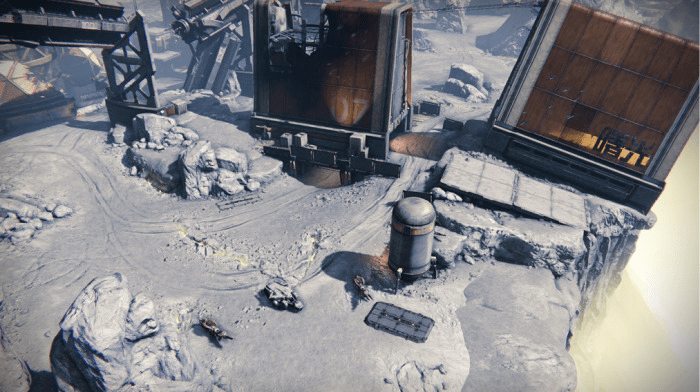 You can pull out your Ice Breaker again – a couple of great spots are at the back of the map next to point B and along either side of the map (the area between A and B, and the area between A and C). One of the heavy ammo spawns is below point A, and the team that controls A will almost always get it! When in Control of A and attempting to recapture B: Use grenades to flush out enemy guardians if the point is being contested or captured. If they push out use your weapon to finish them off. Much of this map is very close quarters. 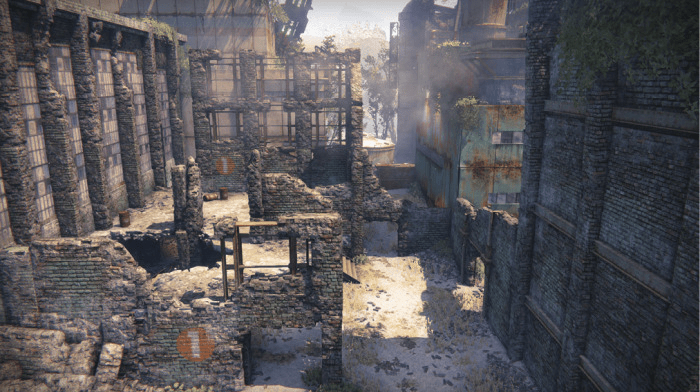 B is definitely the hardest point to defend but it’s a great spot for multi-kills from grenades, supers or rockets. B will definitely flip sides more often than either of the other points, but its central location means you should be aiming to have it plus either of the other points as trying to control both A and C means you’ll have to run too far to defend either point. 80% of the map is a sniper’s paradise! Control the vehicles – a Pike will spawn right near your team wherever you begin, so someone capable with vehicles should pick it up and roll with it for as long as you can. Likewise, when the Interceptor spawns try to pick it up – as long as there’s no heavy ammo spawned. The turret outside B makes it very easy to defend point B but be wary of enemies coming from C and grenading you from behind. The turret is best used if your team controls C already, as the danger of people coming up behind you decreases somewhat. If your opponents are in a turret, Interceptor or on a Pike a single rocket will take them out and make your lives a lot easier. Machine guns work too, but leave you more vulnerable than a well placed rocket. As with First Light, controlling the Pikes is important on Bastion. The Interceptor loses some of its charm here, but is still a beast in the right hands. As with First Light, if you’re using the Turrets, be aware of enemies around you as one grenade can take you out with ease. B and C are the closest points to each other and as such are the easiest to defend, so use this to your advantage. Not only is heavy ammo just as important here as it is on First Light (or on any map), there are also three spawns (one near each point). Try to control as many of these as possible to deny your opponents the easy kills that comes with heavy ammo.